As a fan of the digital writing workshop, I believe that when teaching writing teachers should focus primarily on the process and only secondarily on the product. Such a focus can help students develop the required know-how and skills applicable to different genres of writing. And because technology is almost indispensable in the writing process, I want to draw your attention to these web tools that you can use with your students in different writing stages. 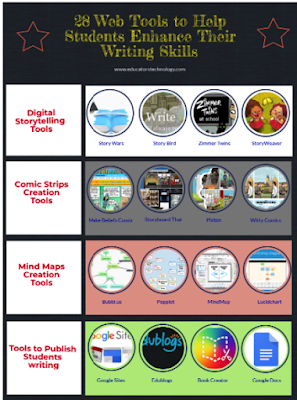 I have basically arranged them into the following categories: Digital storytelling tools, Comic strips tools, Mind mapping tools, story starters, Writing mechanics (grammar and style), Graphic organizers, and Tools for publishing students writing. Good for collaborative writing on digital storytelling projects. Join a creative community of story tellers and get inspired to write your own stories. It offers a great story creator tool that allows students to write their own stories and share them with others. Create and narrate your stories using beautiful visuals and storyboards. Create amazing comics using a wide variety of materials including characters, speech bubbles, props, backgrounds, objects and many more. A good tool for creating visually attractive concept maps. No software download required and maps you create can be saved as an image. It also supports different sharing and collaborative features. It offers various features including: recording notes in different formats with text, images and drawings; link notes to each other; export your final work as PDF or JPEG; supports several languages and many more. You can use Lucidchart to design concept maps, flowcharts and different types of diagrams. It also support collaborative features and works across several devices. Choose from four story starter themes: adventure, fantasy, sci-fi, and scrambler. Offers practical tools to engage students creative writing. Helps you correct spelling mistakes and grammatical errors. Helps you refine your style and improve language structure and lexicon. It offers various tools to help students with their writing including Quill Grammar and Quill Proofreader. An excellent educational platform to help students create, published share their writing creations. Another great option to publish one’s writing in various formats including a web link. Share your writing in the form of blogposts.